This is the video I’ve just put up this evening discussing the Israel lobby and the anti-Semitism smears. I begin by saying that this follows on from the video I made about Chris Williamson’s suspension from the Labour party and the smears against him. I also make it clear that I have very harsh words to say about the Israel lobby and the Chief Rabbi and Board of Deputies of British Jews. I am not an anti-Semite, and condemn categorically all forms of racism, including anti-Semitism. And I absolutely despise the vile conspiracy theories about the Jews running the world, that resulted in 6 million innocents being murdered in the Holocaust death camps. But some conspiracies do exist. And this is one of them. Conspiracies are covert, secret political plots, which this is. I explain that the anti-Semitism smears are Israel’s defence against criticisms of its oppression of the Palestinians. Ten years ago the journalist Peter Oborne made a documentary for Channel 4 about this, and the way the Israel lobby exerts influence in parliament with the groups Conservative Friends of Israel and Labour Friends of Israel. It has also tried to silence reporting of Israel’s atrocities by the press and media. One of the speakers in Oborne’s documentary is Alan Rusbridger, the former editor of the Guardian. He says that whenever they reported Israel’s crimes, someone would come along from the Board of Deputies with a lawyer and accused them of anti-Semitism. And the same was done to the BBC. When they reported the massacre of Palestinians in the Sabra and Shatila refugee camps by the Christian Phalange, Israel’s allies, the Israel lobby accused them of anti-Semitism. This included reporting by respected journalists like Jeremy Bowen or Orla Guerin, who should be above reproach. The Beeb referred the case to an independent watchdog, who stated that their reporting was objective. Avi Shlaim, a respected Israeli professor of Middle Eastern studies at Oxford University also appears in the documentary to confirm that the reporting was correct. I say that if the Chief Rabbi and Board of Deputies confined themselves to spiritual matters and defending Jews against genuine anti-Semitism, I would support them. Any decent person would. But they don’t. They are part of this smear campaign. And the former Chief Rabbi, Jonathan Sacks, is in my view a horrendous bigot. When he was Chief Rabbi he caused outrage by calling Reform Jews ‘enemies of the faith’. This is the language of persecution. It is the language used by the Roman Catholic Church during the Middle Ages against heretics, Jews and Muslims. And it is the language radical Protestants also used against others. Sacks was also responsible for leading a contingent of British Jews on the March of the Flags in Israel. This is a day when the Israeli equivalent of boot-boys march through the Muslim quarter of Jerusalem, vandalising their homes. It is done to keep them in their place, like the EDL and other Fascists in Britain marching into Muslim areas, the BNP marching into Black and other areas, where the people are ethnic minorities, and Oswald Mosley and the BUF marching into Cable Street to terrorise the Jews there. I state that not every Jew is a supporter of Israel, and until recently Zionism was a minority position amongst Jews. The Yiddish-speaking masses of the Bund in eastern Europe, the Jews of Poland, Ukraine, Russia and Romania, wanted to remain in the countries in which they were born. The same in America, where American Jews had a comfortable life. There is also a strand of Orthodox Judaism that rejects Zionism. This believes that the restoration of Israel can only come by the hand of the Almighty through the Messiah, when it will be aided by the nations of the world. Its restoration as a secular state or by secular power is a blasphemy. I also state that Jews, who speak out about Israel and its crimes suffer appalling abuse. They are called ‘self-hating’, accused of anti-Semites. I mention how Tony Greenstein was told by an opponent that they wished his family had died in the Holocaust. In the Labour party, the smears began a few years ago when Ed Miliband – who was Jewish! – was leader of the Labour party. He was accused of being anti-Semitic, or the Labour party was accused of being institutionally anti-Semitic. This was the first time Maureen Lipman resigned from the Labour Party. It has got worse under Jeremy Corbyn, because Corbyn is a supporter of the Palestinians. He is not an anti-Semite and is a fervent anti-racist. This is all being done by the Israelis through the Ministry of Strategic Affairs by cabinet Minister Gilad Erdan. The current anti-Semitism smears in the Labour Party are a response by Israel to criticisms of its oppression of the Palestinians. They have been used to try and silence newspapers and broadcasters like the Guardian and BBC. Nearly a decade ago Peter Oborne made a documentary for Channel 4 describing this and the methods they use to obtain parliamentary support. Britain’s Chief Rabbi and the Board of Deputies of British Jews are part of this smear campaign, although many Jews do not support Israel. And those who also voice criticisms are smeared as ‘self-hating’ and anti-Semitic. The smears started when Ed Miliband was leader of the Labour party, despite the fact that he was himself Jewish, and have increased under Corbyn, who is a supporter of the Palestinians but not a racist or anti-Semite. I am fervently opposed to racism and anti-Semitism, and absolutely condemn the vile conspiracy theories about world Jewish power that led to the murder of six million innocents in the Nazi death camps. On Sunday, the deliberately misnamed Campaign Against Anti-Semitism held a rally outside the Labour Party’s HQ, protesting against the party’s anti-Semitism and demanding the removal of Jeremy Corbyn. The CAA’s leader, Gideon Falter, declared that Corbyn had made the party a haven for anti-Semites and Holocaust Deniers. As Falter knows, or should know, this is a flat-out lie. Corbyn has always campaigned against all forms of racism, including anti-Semitism. And the stats from his own wretched organisation show that under Corbyn’s leadership, anti-Semitism in the Labour party has actually fallen. It’s now lower than in other parties, such as the Tories, and wider British society, where it has actually risen. But the CAA aren’t worried about such inconvenient things as facts. They’re true-blue Tories to a man and woman, and the organisation’s real purpose has absolutely nothing to do with combating anti-Semitism. They’re a pro-Israel outfit, who use the standard Zionist tactic of smearing the country’s critics as anti-Semites when they make awkward criticisms of it and its barbarous treatment of the Palestinians. This treatment includes apartheid, massacre and ethnic cleansing. But any mention of this, even by respected journalists, is rigorously policed and suppressed by the Israel lobby, who accuse those reporting it or commenting on it as anti-Semites. In the past, those reporters, who have been so attacked have included the Beeb’s Jeremy Bowen and Orla Guerin. And also Jonathan Dimbleby, when he made a comment objecting to the smears against his colleagues. This alone shows how the anti-Semitism smears are a real, political witch-hunt, of the type Arthur Miller described in his classic play, The Crucible. This used the 17th century Salem witch hunt as a metaphor for the McCarthy witch hunts against suspected Communists in ’50s America. Which is also appropriate, given the way various speakers at the CAA rally seemed to be convinced that he was another Marxist. In fact, the numbers who turned up for the CAA’s rally were small. There were no more than 250 of them, which is about the entire membership of the CAA plus a few of their mates. So, hardly a mass movement showing widespread discontent against the Labour leader. And Falter also crossed the line when he demanded Corbyn’s removal. The CAA is registered as a charity. Under the rules of the Charity Commission, registered organisations have to be non-political. But the CAA has clearly broken this regulation by demanding the Labour leader’s removal. As a result, Tony Greenstein, a long-time critic of Israel, who has also been smeared as an anti-Semite by the Israel lobby, posted up on his website yesterday a new post about the internet petition requesting the Charity Commission to remove it as a registered charity. 5,000 people had signed it so far. Mr Greenstein was hoping this would double by the end of this week. The CAA’s pro-Israel, anti-Palestinian agenda was inadvertently demonstrated by comic actress Maureen Lipman, who spread her own lies and falsehoods at the rally. Lipman turned up with a placard saying ‘Corbyn Made Me a Tory’, and made a speech in which she claimed that she had left the Labour party because of Jeremy Corbyn. Whoops! No, she didn’t!. She left the Labour party in 2014 after the election of Ed Miliband as leader. This was because ‘Red’ Ed had also proposed some pro-Palestinian policies. She was complaining then about how his election showed that Labour was anti-Semitic. Hardly. Most people would probably argue otherwise, as Miliband is of Jewish heritage. For some people, some of the attacks on him and his father, Ralph, such as those of the Daily Mail, also had very nasty anti-Semitic overtones. As Mike’s article on this shows, the internet has been having immense fun with Lipman’s selective memory. Jokes about her include the suggestion that she has a time machine to go back to Ed Miliband’s election, so she could resign then in protest against Corbyn’s election. Lipman also let the cat out of the bag about the real, underlying reason for the protests against Corbyn. She attacked him for always criticising Israel, and sticking up for the Palestinians. This is exactly the reason behind these allegations, and the pressure on the Labour party to adopt a definition of anti-Semitism that defines as including criticism of Israel. This is despite the fact that Wilhelm Marr, the noxious German politico, who founded modern anti-Semitism in the 19th century and who coined the term, defined it solely as hatred of Jews as Jews. I’m not surprised Lipman turned up at the rally. She has appeared in the press making noises about how Corbyn is a supporter of ‘terrorism’. She said it a month or so ago in an interview in the pages of the Radio Times. At the rally, she also claimed that Corbyn was a Marxist, who was trying to bring it back because it had worked so well in the rest of the world. As so many people have pointed out, including Mike over at Vox Political and this blog, Corbyn isn’t a Marxist. He’s actually centre left, closer to the social democratic consensus which advocated a mixed economy, strong trade unions and social mobility. George Galloway despatched the accusation that Corbyn was a Marxist a year or so ago. The Scots political maverick stated that he’d known Corbyn for a very long time, and he wasn’t. But why let inconvenient facts get in the way of a good, Tory and Blairites smear? The accusation that Corbyn’s a Marxist says nothing about him, but it says plenty about Lipman and her supporters. Rather than being a ‘disenfranchised socialist’ as she claimed, she comes across as another Blairite, worried that Blair’s policy of handing large sections of the state over to private industry is now going to be stopped by Corbyn. Communism didn’t work, although the capitalism that succeeded it in Russia hasn’t made things any better for ordinary people over there either. And neoliberal capitalism is failing here. It has brought ordinary working people in Britain and across the world nothing but poverty, starvation and hardship, all for the profit of big business and the immensely rich. Corbyn’s right to end it. The CAA’s rally on Sunday was a pathetic affair, at which they just spewed the usual accusations against the Labour leader, all in support of the real reason for wanting his removal: to continue the ethnic cleansing of the Palestinians without criticism, and keep the Blairite neoliberals in control of the Labour party. It’s depressing to see Maureen Lipman supporting them, as normally I have a lot of respect for her. But all too often you find that people you respect have monstrous or repulsive views in some area or another, and Lipman is no different. The papers and TV news were naturally full of the anti-Corbyn rally organised by the Jewish Leadership Council and Board of Deputies of British Jews. They claim Corbyn is an anti-Semite and sides with anti-Semites in the Labour party. As I’ve blogged about countless times before, this is vile rubbish. Corbyn and his supporters aren’t. The real reason they were protesting is that he wants a just settlement with Palestinians which will stop the ethnic cleansing and the theft of their land. But this is too much for the racial nationalists of the Israel lobby, who are driven into a sanctimonious, self-righteous fury if anyone dares to mention how racist Israel is, or reports the brutality it metes out to the Palestinians and other Arabs. Amongst the piccies of the pro-Israel racists and hypocrites all decrying Corbyn in the I newspaper was this little photo below. 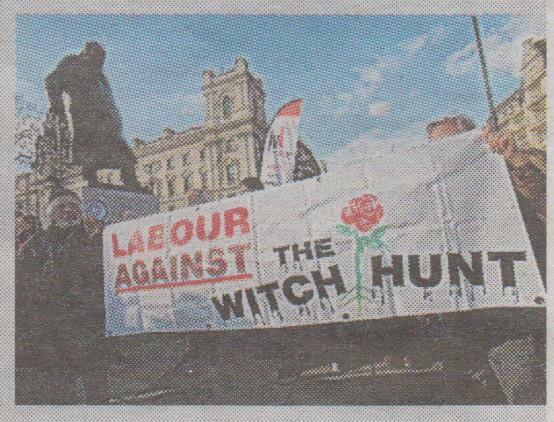 It’s of a group from Labour Against the Witch Hunt. The I never commented on them, which seems to me to indicate that they either didn’t know who they were, and thought they were another group of anti-Corbyn protesters. Or the I knew full well who they were, but were afraid to point them out in case they too were smeared as anti-Semites simply for reporting them. Labour Against the Witch Hunt very definitely aren’t connected to the Israel lobby, and the British mouthpieces like the Jewish Leadership Council. They directly opposed to them. They’re for all the Labour members, that have been wrongly expelled, suspended or smeared as anti-Semites. As I’ve stated repeatedly, these people include self-respecting, secular and Torah observant Jews and genuinely anti-racist gentiles. Many of these people, Jews and gentiles, have been attacked by real Nazis for trying to combat racism and anti-Semitism. And the Jews smeared are often people, who have suffered anti-Semitic abuse and assault. And I have no doubt that many of them did have family members butchered in the obscenity of the Holocaust. But they are not going to get coverage from the press, the Beeb and the other TV channels. Because these are all biased towards the Tories, or else back the Blairites, who are deeply enmeshed in the Israel lobby. And the power of the Israel lobby is too strong for many editors. These bigots are so arrogant, that they even claimed respected BBC jouros like Jeremy Bowen and Orla Guerin were anti-Semitic, simply because they dared to report Israeli atrocities during the invasion of Lebanon. And when Jonathan Dimbleby criticised these smears, he too was investigated for anti-Semitism. Corbyn isn’t an anti-Semite, and this isn’t about anti-Semitism. This is about the Israel lobby using it as a weapon to get rid of a Labour leader they hate and fear, backed by a craven, mendacious and deeply compromised press. It’s long past the time it was stopped. Presented by the Conservative journo Peter Oborne, this is a very hard-hitting and extensive investigation into the malign influence and tactics of the Israel lobby. It covers not just the soft corruption of political lobbying – the various donations in money and paid trips to Israel given to Tory and Labour politicos, but also the co-ordinated smear campaign against anyone who dares to speak out in favour of the Israeli state’s victims. It’s a smear campaign that has seen very respected members of the Jewish community, including senior rabbis, and BBC journos like the late Orla Guerin, Jeremy Bowen and even Jonathan Dimbleby accused of anti-Semitism. The result has been that the Beeb was pressured not to put out an appeal for the victims of Israel’s invasion of Gaza, and there was complaints about its coverage of those murdered by Israel’s allies in the Christian Fascists of the Lebanese Phalange in the Sabra and Shatila refugee camps. And there has been constant pressure by these same bullying thugs on the Groaniad under its former editor, Alan Rusbridger. Who really does look like Harry Potter. Much of this pressure and screaming abuse seems to have come from America. The organisations are carefully structured, so that they keep the total number of donations secret, and their donors hide behind anonymity. When investigated they repeat the same, smooth words about just trying to keep the argument open by presenting Israel’s case, or mutter platitudes about supporting a two-state solution. All the while doing their level best to make sure that their voice is the only the British public hear, and rabidly pursuing business deals on stolen Palestinian land. I’m afraid I may have misheard some of the names in the programme, and so misspelled them, but they should be roughly accurate. The documentary begins with the Israeli invasion of Gaza and the Conservative Friends of Israel. Despite the horrendous carnage and destruction wrought, David Cameron in a speech made no mention of this, but instead praised the Israelis and his pledged his lasting support to them if he became Prime Minister. It was this that prompted Oborne to launch his own investigation into the Israel lobby. He makes the point that they have influence on both sides of Parliament, as shown by an exchange between a Conservative MP, who was a member of Conservative Friends of Israel, who asked a question about Israel’s continuing safety. This was answered by a Labour MP, who was a member of the Labour Friends of Israel. Oborne then interviews Michael Ancram, former Tory Shadow Foreign Secretary from 2003-5, about the Israel Lobby’s influence. as well as Sir Richard Dalton, the former British ambassador to Iran from 2003-6. Dalton states clearly that the Israel Lobby does exist, and is important in defining the debate about Israel and the Palestinians. The Conservative Friends of Israel is highly influential, and boasts that it includes 80 per cent of all Tory MPs. Its chair, Richard Huntingdon, received £20,000 last year (2008) in donations, and gave £34,000 to the Conservatives. And the director of the No. 10 club, that exclusive Tory fundraising outfit in which, for a mere £50,000, you can meet David Cameron or have lunch with William Hague, is also included. The Tory Friends of Israel also arrange paid trips to Israel for MPs. So far there have been more of these than equivalent trips to America and Europe combined. Oborne states that in fairness, he has to say that he went on one of these, and there was no pressure to report favourably about Israel. But two MPs, who went on one of these trips, then received afterwards £25,000 in donations. This prompts Oborne to ask Ancram if this explains the soft line taken by the Tories about Israeli influence, and why the Tories don’t like to talk about it. The documentary then moves on to the Israeli invasion of Lebanon, during which 1,000 Lebanese civilians were killed, and $3.6 billion’s worth of damage inflicted. Michael Howard gave William Hague £25,000 in donations. Hague then made the mistake of making a speech criticising the Israeli response to Lebanese attacks as disproportionate. As a result, Lord Kalms, a CFI donor and head of the Dixons electronics chain, was outraged, and threatened to withhold further funding. Which he did, and Hague never received a penny more. The Israel lobby attacks even the mildest criticism of Israel. The director of the CFI, Stuart Pollak, had a meeting with David Cameron after the speech. Then, at his lunch with the CFI, Cameron didn’t mention the Lebanese invasion at all. The programme then moves on to the organisation’s income, as revealed by the Parliamentary Accounts Register. For comparison, the pro-Arab lobby revealed that they had been given £43,000 in donations. How many had the CFI been given? No-one knows. They didn’t register any. They’re structured as a group of individuals, and are not incorporated, so they don’t have declare any under the rules. In 2008 the CFI gave the Tories £2 million, but this is not the whole story. One Tory MP said that after a chance meeting with Stuart Pollak, he received two donations from businessmen he had never met, and who did not live in his constituency. The CFI gave £30,000 to Cameron’s team. And in 2005 Cameron met Plocha Zabludowicz, who gave the future Tory PM £15,000 and a further £35,000 to Tory Central Office. The total figure for the donations given by the CFI is £10 million, more than the other lobbies. Then there’s the incident of the UN vote over a motion censuring both Hamas and Israel for the carnage in Gaza. The CFI rang Hague up to condemn the resolution and demand that he criticise it. Which he duly did. But the Israel Lobby only became really powerful in Britain under Maggie’s favourite Labour pet, Tony Blair. Jon Mandelsohn, a prominent pro-Israel lobbyist, stated that ‘Zionism is pervasive in New Labour’ and ‘It is axiomatic that Blair will come to Labour Friends of Israel meetings’. There are more Labour MPs in Labour Friends of Israel than their opponents across the benches in the Tory Friends of Israel. The documentary describes how Blair met the rock entrepreneur, Lord Levy, at the Israeli embassy, who then raised £15 million for the Labour party before the row over ‘cash for questions’. When Blair became PM in 1997, he gave Levy a life peerage. Levy, however, was unpaid and never a formal servant of the British state, so that the deals he made as Blair’s special envoy to the Middle East between Israel and the Arab nations could be kept secret. The programme interviews Prof. Avi Shlaim of Oxford University’s Middle East department, who states that he considers Levy has damaged Britain’s reputation in the Middle East. The documentary then moves back to CFI lobbyists at the Tory party conference. Their purpose there is to make sure Cameron’s policies are in line with Israel’s This means that Michael Kaminski, the Polish leader, who heads a small, far right nationalist party, is lionised by the Tories, despite his record of making anti-Semitic remarks and his refusal to apologise for the suffering of Jewish Poles during the Second World War. Stuart Pollak was most keen not to have Cameron’s speech to the CFI at the Tory conference covered. He is shown waving the camera crew away. The CFI totally support Kaminski. They also plead that they’re totally transparent through the distinction between their donations as a group, and those of individual businesspeople. The documentary then moves on to January, 2009 and the invasion of Gaza, and allegations of Human Rights abuses by Israeli forces were still circulating months later. But Oborne points out that you wouldn’t know it from the contents of the News of the World and the Mirror. Both these rags ran stories instead about the threat to Israel from the surrounding Arab nations. The hacks behind these pieces had been given free trips to Israel by BICOM, one of the wealthiest lobby groups in Britain. Oborne then goes on to interview David Newman in his office in Jerusalem. Newman worked alongside BICOM in disseminating Israeli propaganda in British universities. Newman states that there is indeed a debate within Israel about the status of the settlements in Palestinian territory. Groups like BICOM close down this debate abroad, and instead demand absolute for Israel. Plocha Zabludowicz, the head of BICOM, is the 18th richest person in Britain. And he is very definitely not part of traditional British Anglo-Jewish society, but came up through the Jewish Leadership Council, who are described as the lords of the big Jewish donors. Oborne then interviews the head of the Liberal Jewish Synagogue, Rabbi Emeritus David Goldberg, and asks if he knows him. Goldberg states that his name doesn’t ring a bell. Zabludowicz is actually of Polish ancestry. He is a Finnish citizen with a house in north London. His father made a fortune peddling Israeli arms, as did Zabludowicz himself before moving into property and casinos. His company is registered in Lichtenstein. He is, in short, ‘a rank outsider’. He was also one of the guests at Madonna’s birthday party in Italy. Zabludowicz generously bankrolls BICOM, to whom he gave £800,000, who wrote a clause into their accounts recognising his generosity. He had given them £1.3 million in the previous three years, and has business interests in the Middle East. These cast doubt on the possibility of reaching a peace deal between Israel and the Palestinians. Oborne then goes on to discuss the case of one of the illegal Israeli settlements in Occupied Palestine, whose supermarket is owned by Zabludowicz. Newman states this indicates the direction in which BICOM is moving. Rabbi Goldberg states that it shows that Zabludowicz calculates that the settlement won’t be returning to the Palestinians, even under the most generous peace deal. As for Zabludowicz himself, he declined to meet the Dispatches team, but instead released a statement claiming that he was a major supporter of the creation of a separate Palestinian state, and that he understood that concessions would need to be made. Oborne was, however, successful in talking to Lorna Fitzsimons, BICOM’s chief executive. She claimed that BICOM was very open, that their donors do not influence policy. When asked about Zabludowicz, she claimed he was different from anyone else and she didn’t know about his business connections. All the organisation was doing was to make journos and people aware of the different strands of the debate on Israel. Oborne moves on to the other groups involved in the Israel lobby – the Jewish Leadership Council, the Board of Deputies of British Jews and the Zionist Federation, and states that some members of these groups are very aggressive towards the TV and press. He then interviews Alan Rusbridger about his experiences of dealing with them. Rusbridger states that some TV editors warned him to stay away from them and the whole subject of Israel and the Palestinians. The Guardian was attacked for criticising Israel in a way that no other country does. There was a special meeting at the Israeli embassy between the ambassador, Zabludowicz, Grunewald of the Board of Deputies of British Jews and the property magnate Gerald Reuben. They were unhappy about a Groaniad article comparing the Israeli’s occupation of Palestine with apartheid South Africa. So Grunewald and his mate, Roman Leidel, decided to pay Rusbridger a visit. Grunewald is a lawyer, claimed that the article was fomenting anti-Semitism, and would encourage people to attack Jews on the street, a risible accusation which Rusbridger denied. This was followed by complaints to the Press Complaints Commission about the article by the pro-Israel American group, CAMERA, or Committee for Accuracy in Middle East Reporting in America, which specialising in attacking journos critical of Israel. The Press Complaints Commission duly investigated the article, and found that only one fact was wrong. When asked about this, Rabbi Goldberg states that Israel is indeed an apartheid state. There are two road systems, one for use by Israelis and one for the Palestinians. There are two legal systems in operation. The Israelis are governed by Israeli law, while the Palestinians are governed by military law. When asked what will happen to him when his comments are broadcast, the good rabbi simply laughs and says that he’ll be attacked once against as being an ant-Semitic, self-hating Jew. Many other Jews are also critical of Israel. Oborne goes on to talk to Tony Lerman, formerly of the Institute for Jewish Policy Research, and now a Groaniad journo. Lerman states that the Israel lobby don’t take into account the diversity of Jewish views on Israel. This is confirmed by Avi Shlaim, who says that there is a split in the Jewish community over Israel. The community’s leaders are largely pro-Israel with a narrow rightwing agenda that is not typical of Jewish Brits. And libelling Israel’s critics as ‘anti-Semitic’ is now common policy. One example of this use of libel is a New York blogger, ‘Hawkeye’, who hunts through the Guardian’s ‘Comment is Free’ column, claiming it is full of anti-Semitic bias. Rusbridger states that this is dangerous and disreputable. ‘Hawkeye’ attacked Lerman in particular as a nasty anti-Semite. Lerman states that this tactic has been adopted because it’s a useful defence of Israel. Rabbi Goldberg concedes that some people might be seriously anti-Semitic, others are just voicing genuine opinions, which should be respected. Michael Ancram, even, was accused of being anti-Semitic, which he said he takes with a pinch of salt. But this leads into the whole question of whether the BBC has been corrupted by the influence of the Israel lobby. On record, BBC journos and spokespeople claim that the Corporation’s reporting of Israel is unbiased. Off-record, the stories different. News staff state that there is always pressure from top management for a pro-Israel slant. Oborne then interview Charlie Brebitt, an accountant at the LSE, who was formerly of Channel 4, who confirms that there is a very strong and active Israel lobby, and a sizable body of sympathy with Israel. The BBC has no choice but to respond. Honest Reporting, another pro-Israel media attack dog, and the other parts of the Israel lobby take advantage of this, alleging that there is an institutional bias at the Corporation against Israel. In 2003 during the Iraq invasion the Beeb broadcast a hard-hitting documentary investigating Israel’s secret nuclear weapon’s programme, entitled ‘Israel’s Secret Weapon’ on the 16th March. The Israeli Press Office issued a statement comparing this to the worst of Nazi propaganda, and imposed restrictions on BBC staff in Israel. When Ariel Sharon, the Israeli leader, visited Downing Street, the only journos banned from covering the meeting were the Beeb. Honest Reporting UK complained that the programme was part of a campaign to vilify Israel. One member of the group, Nathan Sharansky, complained that the late Orla Guerin, here shown with two eyes, was anti-Semitic, and that she shared the goals of Palestinian terror groups.